This cockatrice coloring page depicts the mythological creature from English legend. Use this cockatrice coloring page in a lesson about mythological creatures. Give the Spanish words for a variety of creatures of the sea. Get a little crazy with these DIY summer camp activities, all about unusual creatures! This handy checklist will make a fine addition to your week of fun. Try our phoenix coloring page to learn about mythological creatures. Use this lamassu coloring page in a lesson about mythological creatures. 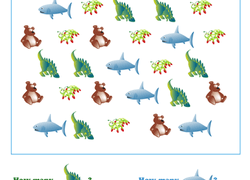 Cut out one of our colorful rulers and measure these sea creatures to answer the questions. No oxygen tank needed. Use this girl and her unicorn coloring page in a lesson about mythological creatures. One thing every culture has in common is a set of folk tales and myths, and this coloring series features mythological creatures from all over the world. Have your child help a few sea creatures figure out their number-filled questions by subtracting first and then multiplying with this word problem worksheet. Reception maths: Take Away the Sea Creatures offers preschoolers an easy introduction to subtraction that will have them wanting to dive right in! This worksheet shows pairs of big and small sea creatures. Have your child identify the bigger and smaller objects to build foundational maths skills. Have your little one help these ocean creatures deal with their day-to-day maths dilemmas with this multi-step word problem worksheet. Help your child learn how to fish out the important steps in a word problem with this worksheet all about the daily lives of various creatures of the ocean. Use this centicore coloring page to learn about the mythological creature. This jackalope coloring page teaches your child about the mythological creature from North America. Try our jackalope coloring page with your child. This kirin coloring page teaches your child about the mythological creature from East Asian folklore. Try our kirin coloring page with your child. This fenghuang coloring page depicts the mythological bird-like creature from East Asian folklore. Use this fenghuang coloring page in a lesson about mythology. The centaur coloring page depicts a mythological half-man, half-horse creature. This coloring page features a mythological dragon. Teach your child about the legendary dragon and cultural folklore with this coloring page. Colour the mythological Loch Ness Monster, who is often referred to as "Nessie". This djinn coloring page showcases the mythological spirit from Islamic legend. Try this djinn coloring page in a lesson about mythology from around the world. This dryad coloring page features the mythological tree nymph from Greek mythology. colour this dryad coloring page as part of a lesson about Greek mythology.